The Month of May at the Indianapolis Motor Speedway will start with the sweetest sound in motorsports – Indy cars at full song on the oval – when Verizon IndyCar Series drivers continue preparation for the 102nd Indianapolis 500 presented by PennGrade Motor Oil with testing April 30-May 2. Testing will conclude with a private manufacturer session for Chevrolet and Honda on Wednesday, May 2. While Patrick will attract plenty of attention with her first laps in an Indy car at IMS since 2011, three-time Indy 500 winner Castroneves also will be in the spotlight with his first drive in the sleek, new Indy car on the IMS oval as he begins his quest to become just the fourth four-time winner in the history of the race. Fans can watch all three days of testing from the Turn 2 viewing mounds, IMS Museum parking lot and South Terrace grandstands. These areas are open from 10 a.m.-5 p.m. April 30 and May 1 and from 9 a.m.-5 p.m. May 2. Testing on April 30-May 1 also will be streamed live on the INDYCAR YouTube channel (youtube.com/indycar) and RaceControl.IndyCar.com. 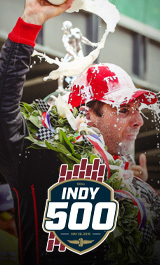 The fifth annual INDYCAR Grand Prix is scheduled for Saturday, May 12 on the IMS road course. The 102nd Indianapolis 500 presented by PennGrade Motor Oil is scheduled for Sunday, May 27 on the IMS oval. Visit IMS.com to buy tickets or for more information about both races and all Month of May happenings at IMS. Month of May tickets also can be purchased from 9 a.m.-5 p.m. April 30 at the IMS Ticket trailer located on the east edge of the IMS Museum parking lot, toward Turn 2. Fan access: Fans can watch testing for free from 10 a.m.-5 p.m. from the Turn 2 viewing mounds, Museum parking lot and South Terrace Grandstands. Month of May tickets also can be purchased from 9 a.m.-5 p.m. April 30 at a trailer located on the east edge of the IMS Museum parking lot, toward Turn 2. Fan access: Fans can watch testing for free from 10 a.m.-5 p.m. from the Turn 2 viewing mounds, Museum parking lot and South Terrace Grandstands. Fan access: Fans can watch testing for free from 9 a.m.-5 p.m. from the Turn 2 viewing mounds, Museum parking lot and South Terrace Grandstands.